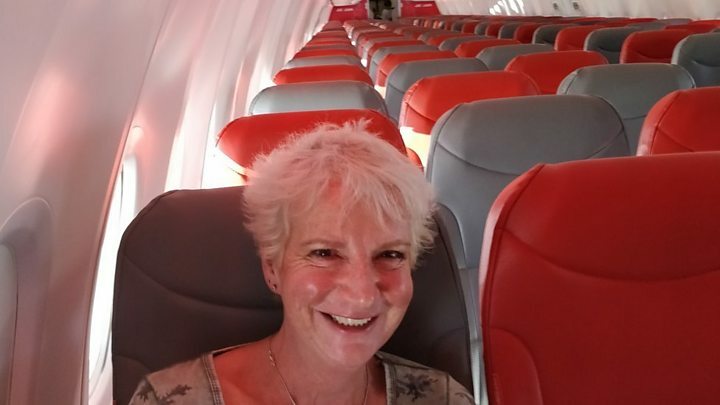 A woman who paid just £46 for a flight to Crete has spoken of her amazement at being the only passenger on board. 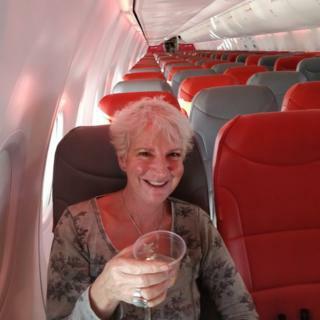 Karon Grieve, from Dunlop in Ayrshire, described her Jet2 flight from Glasgow to the Greek island - which normally carries 189 passengers - as "surreal". She was given the VIP treatment after two other passengers booked on the flight failed to turn up. Jet2 said it was "not unusual" for the final flight of the season to have fewer bookings than normal. Ms Grieve, who was travelling to Crete to write a crime novel, said it was immediately obvious there were very few passengers when she turned up at the airport for her 16:30 flight on Sunday. "The guy was laughing at me and he said 'oh come on, guess'. "We got it down from 10 to four and he said 'you'll never guess it, there's only three of you'. "But when I got to the actual gate, the other two people hadn't turned up." Ms Grieve said that, because she was the only passenger, all of the flight crew knew her name. She said: "We were all on best friend terms before we'd even got on the plane. "The captain was fantastic. She came and sat beside me while the first officer did all the flight checks and we were chatting away about the flight." While the plane was in the air, Ms Grieve said that the captain addressed her by name from the cockpit. She said: "Every time she made an announcement she said, 'Hi there Karon, you'll see Croatia on your left-hand side', and then we flew through this amazing lightning storm and she suddenly came on and said, 'Hi Karon and the girls, quickly run to the other side of the plane and look at this, it's amazing'. Ms Grieve said she intended to spend the next month in Crete writing her book before returning to Scotland. However, she acknowledged the chances of experiencing a similar return journey were remote. A spokeswoman for Jet2 said: "This was our last flight to Crete from Glasgow Airport this year, marking the end of a very busy and successful season. "We're delighted that Karon got to experience our VIP customer service in style onboard our award-winning airline. "It is not unusual for the final outbound flight of the season to have fewer bookings than normal, and the return flight back to Glasgow was completely full with customers returning from a lovely holiday. We hope Karon has a fantastic time in Crete and that we got her trip off to a great start."